I love inspirtational books. I have read so many acedemic books an d have learned many wonderful things. Unfortunately those books rarely chnage my life. I am convinved that the problem with churhces today is that they are teaching something (the Bible) that is absolutely true but they fail to lead their hearers to life change. In a Pit With a Lion does just that. It inspires real people to take truth and make life application. It inspires us not just to live but to live abundantly. Taking from the description of Benaiah in the list of King David's mighty men in 2 Sam 23:20-21, Batterson shows how God uses unlikely cicumestances to prepare us for our future calling. He challenges us to chase those lions, rather than running. He points out that we don't always prevail (humanly speaking) in these unlikely circumstances but that but we will never realize God's greatest plans for our lives if we never chase the lions. This is a great book and I strongly recommend it. 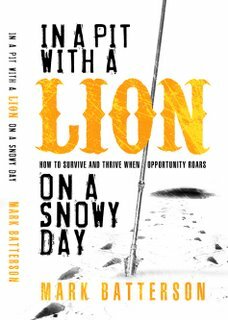 My team will be reading it together to help prepare us to chase lions in Paris.